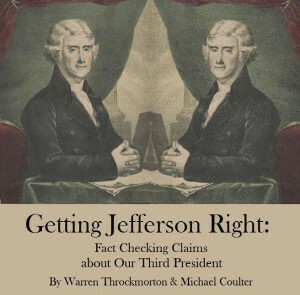 In mid-April, Warren Throckmorton & Michael Coulter, professors at Grove City College (PA) will publish on Amazon.com their eBook titled, Getting Jefferson Right: Fact Checking Claims About Our Third President. 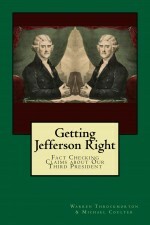 ile the authors also address claims made by those who view Jefferson as an athiest, they zero in on false or misleading claims made by evangelical Christians.To get an idea of the kinds of questions the authors examine, take this quiz. Did Jefferson and other Founders finance a Bible in 1798 to get the Word of God to America’s Families? Did Jefferson found the Virginia Bible Society? Was Jefferson an orthodox Christian, who only rarely expressed questions about orthodox Christian doctrine? Did Jefferson approve laws providing federal funds to evangelize Indians? Did Jefferson edit the Gospels of the New Testament to remove sections he disagreed with? Was Jefferson legally allowed to free his slaves?